William G. Knoebel has more than 26 years of experience handling disability insurance appeals before local offices of the Social Security Administration, the Office of Disability Adjudication and Review, and the Federal District Court. He is a frequent speaker on the topic of handling disability cases and is a member of multiple groups on the local and national level that focus their practice in the areas of Social Security Disability and Supplemental Security Income cases. He can assist you with your case beginning with the initial application, through all levels of administrative appeal (reconsideration and hearing), and often represent claimaints in Federal Court. He has represented clients at Social Security hearing offices from as far north as Portsmouth, Ohio, west to Indianapolis, Indiana, east to Huntington, West Virginia, and south to Louisville and Lexington, Kentucky, as well as many sites in between. 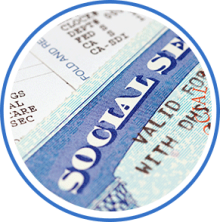 The application process tor Social Security Disability benefits and Supplemental Security Income can be confusing and frustrating. Our goal at Knoebel & Vice, PLLC is to help you get through this process with minimal frustration. Call today for a free consultation. In the initial stages of a disability claim, it is not unusual for a claim to be denied for reasons that do not seem justified. Our attorneys can help you understand why your claim was denied, improve your chances for winning your disability claim by preparing your appeal, and make sure your file is complete and ready for your hearing before the Administrative Law Judge when necessary. Our attorneys will meet frequently with you during the process so that you will always feel informed about the status of your case. For many clients, disability benefits are important, but for others the primary concern is assistance with current and future medical bills. If you are awarded Social Security Disability benefits, you will also be eligible for Medicare. If you are entitled to Supplemental Security Income benefits, you will also be eligible for Medicaid. The attorneys at Knoebel & Vice, PLLC can help you understand the difference between Medicare and Medicaid and help improve your chances of obtaining these important benefits. In most cases, attorney fees are contingent upon winning your case. If you are not approved for disability benefits, the attorneys at Knoebel & Vice, PLLC do not charge for their services. For more information regarding Social Security please visit www.ssa.gov.